Nomadic life examines all aspects of nomadic culture from technology to sociology. The emphasis will be heavy on personal experimentation in nomadic architecture, transportation, economy and social interactions. Hot on the heels of the previous post which was about goatwalking, here is a post on how nomads use animals to make their lifestyle possible. 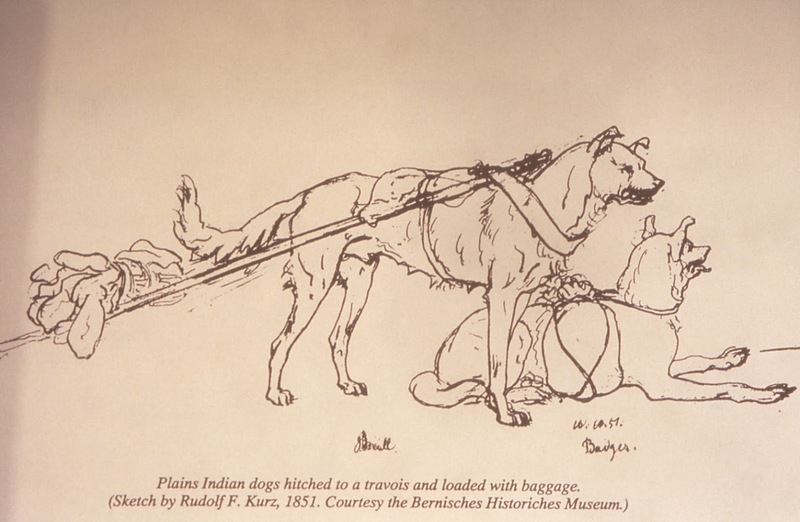 Without the help of animals, nomadism would at best be a part-time proposition. 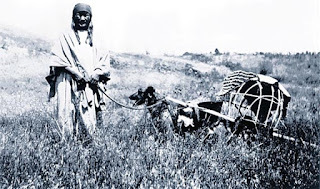 It's probably safe to say that nomadism as a lifestyle was not really practical for humans until we started domesticating animals. More on that idea in a later post. Wattage is a term from physics that is used to measure physical power. Power is a measure of how much physical work you can do per unit of time. Horsepower is another measure of power. One horsepower is 746 watts. Whereas energy is a quantitative measure, power is a measure of the rate at which energy can be produced. You can consume or produce a quantity of energy but can't consume or produce power. That's why the electric company doesn't charge you for watts but for watt-hours. Humans are capable of maintaining 100 watt output for hours at a time. Yeah, that's right, about as much wattage as a bright incandescent light bulb. In other words, not much at all. Horses apparently can sustain 746 watts. 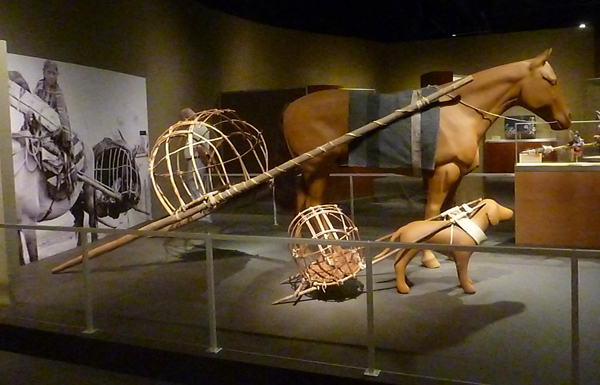 This is why the domestication of the horse was a big deal. One horse could do the work of seven and a half people. I don't know about horsepower, but the 100 watt rate for humans is the power a fit adult human can put out continuously for eight hours, let's say bicycling for 8 hours or carrying a backpack for eight hours while walking. Peak power is of course greater, say for someone doing a hundred meter sprint. I assume horsepower at 746 watts is also an average say for a horse pulling a cart at a rate it can maintain for 8 hours. Eight sled dogs have roughly the power of one horse or 93 watts per dog. 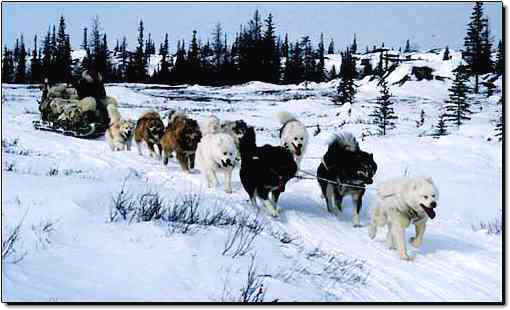 One sled dog power is therefore roughly equal to one human power. The thing to keep in mind here is that wattage when applied to animals is a measure of how much useful work they can do in a given time period, not how much energy they burn in that time period. One of the things that the early thermodynamicists discovered was that when you use up heat energy to create work, only some of the energy gets converted into useful work. The ratio of useful work to energy expended is called efficiency. Animals eat food and burn it to create energy. Some of that energy is used by muscles to do work. The rest is radiated into the environment as heat. But enough of that. 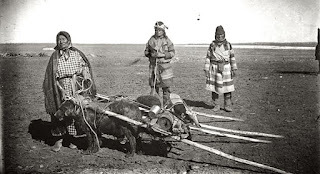 Lets get on to the meat of this post, how the availability of power affects nomadic lifestyles. Here's some nomads, apparently carrying all their own stuff. Looks like there's a mom and a dad and a child. Mom and dad seem to be carrying all the stuff, the child carries his/her own clothes. That's it. What we have is a 200 watt unit, (two light bulbs). Right now they are sitting still, running at 0 watts. Once they get up and start walking with the packs on their backs, they will be running at 200 watts. But what if they had a horse? A horse can put out as much wattage as seven and a half humans. If they added a horse to their family, they could carry 946/200 or 4.73 times as much stuff. The horse of course would need an input of energy, but that seems to be available in the form of grass all around them. People such as the people in the picture are regarded as primitive. 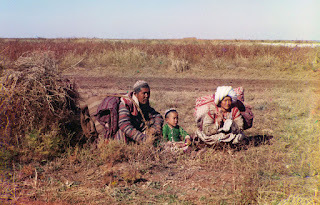 They are primitive because they don't have as much stuff as settled people, but there's no way that nomads can have as much stuff as settled people because they have to carry their stuff around and they have only so much wattage. Being humans, nomads are as smart as settlers and could in principle create a lot of the wonderful stuff that settlers create. Only they don't because they don't want to or can't carry it around. 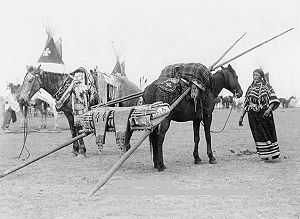 American Indians of the Great Plains were mostly agriculturalists until they got horses. 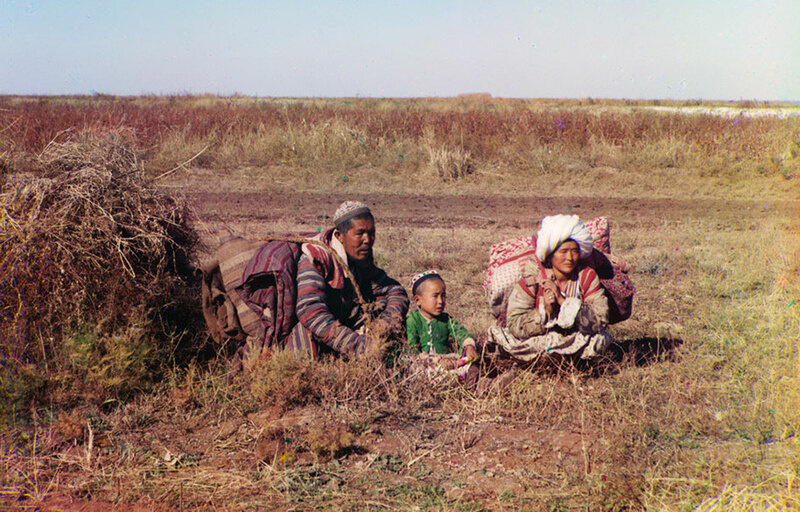 Once they did, a number of the tribes, but not all switched from agricultural to nomadic life styles within decades. 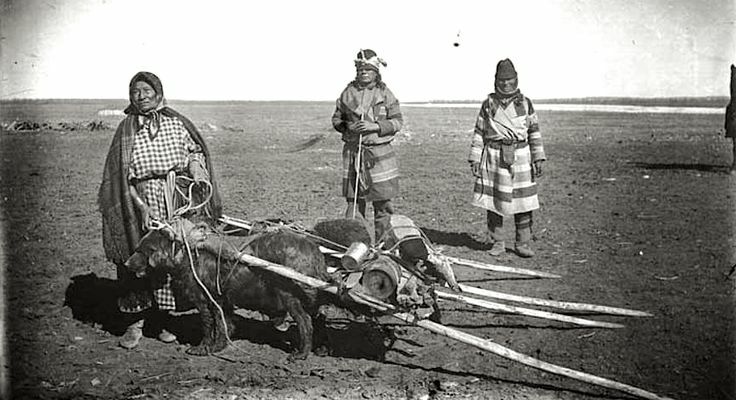 Without horses, a nomadic life style on the plains was difficult to pull off. You had to carry everything on your back or maybe get your dogs to carry some stuff. Each dog added another 93 watts of transport power. 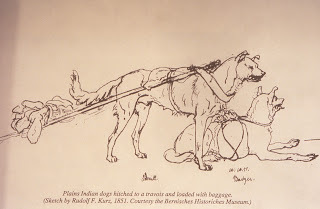 More dogs meant more transport power, but of course you had to feed them so that put a limit on how many dogs you could keep. 93 watt dog side by side with a 746 watt horse. 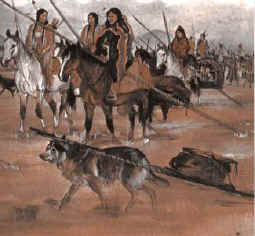 The addition of horses allowed nomadism in the Great Plains to take off. 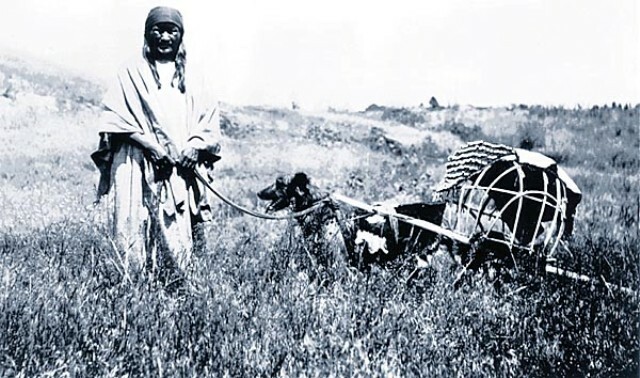 Dogs were still used, but horses allowed for the transport of heavy buffalo hide covered tipis. The additional benefit of horses on the plains was that they could eat the grass, which dogs could not do. You still had to feed dogs. There was an upper limit on how many dogs you would want to keep but you could keep a lot more horses seeing that they could feed themselves. But perhaps the biggest reason that horses made nomadic life on the plains possible is that horses allowed plains dwellers to kill enough buffaloes to subsist on them. A human on foot was limited in how many buffaloes he could kill. Also, buffalo herds could travel much further than humans on foot and could easily travel out of range of hunters on foot. A hunter on foot had 100 watts at his disposal. A hunter on a horse had 746 watts at his disposal. Big power gain allowing for greater range and speed. 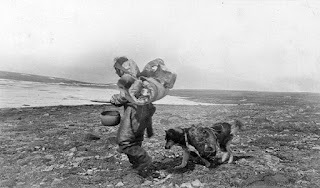 In the American Arctic, people used dogs to up the wattage of their households. Dogs were especially useful in the winter since sleds on snow required much less wattage to transport goods than dogs carrying stuff on their backs. 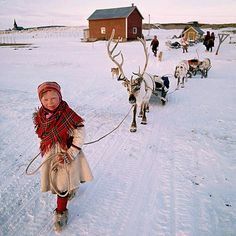 Over in the Nordic and Siberian Arctic, people used reindeer to haul their goods. I don't know the wattage of a reindeer but it is probably greater than that of a dog and less than that of a horse. I could go on with camels, oxen, yaks etc. but the point is that nomadism on foot is a questionable enterprise due to the low wattage of humans, but nomadism with the assist of animal power makes it a practical proposition especially if the animals do not need to be fed by the humans, that is, if the animals are vegetarians. Peter Andrew's list of publications - probably your link to the most complete documentation of nomadic tents.